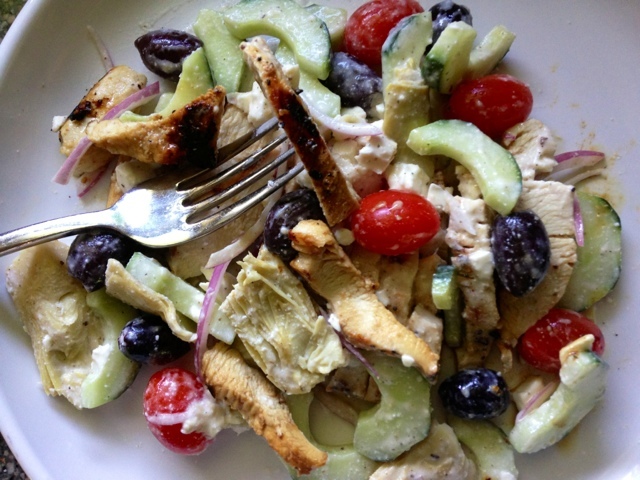 I love eating salads in the summatime when all the cukes and tomatoes are ripe for the pickin' in my garden. But we had flooding in our side yard this summer and I lost my sweet little garden. It was sad, but I was so grateful the damage was minimal to our yard and basement. It could have been worse. 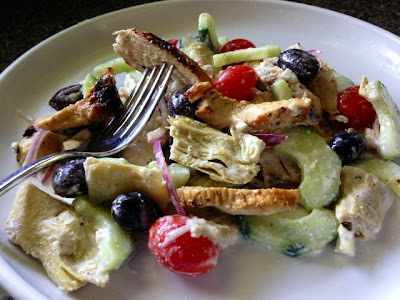 This salad is a great to make anytime of year because you use English cucumbers (the ones that you don't have to peel) and little grape tomatoes which are always available. 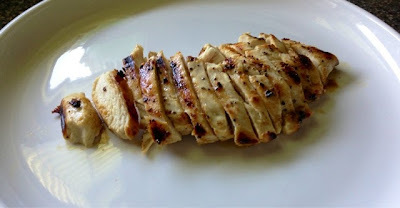 Slice your chicken in half, making thinner cutlets. 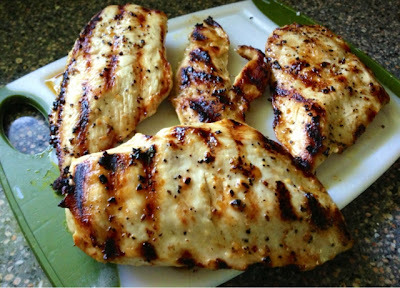 Season with lemon juice and sprinkle with grill seasoning. Grill on outdoor grill, or inside on a grill pan, until cooked through. 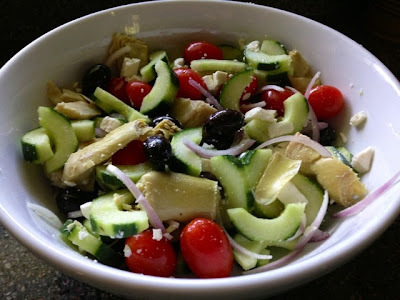 While the chicken is cooking, mix together all the salad ingredients in a large bowl. 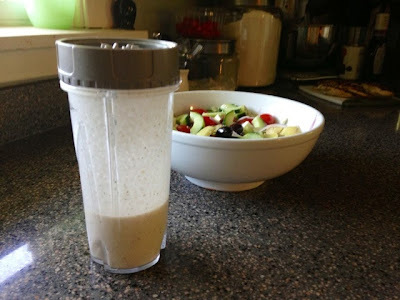 Make your dressing by mixing your dressing ingredients together in a mini food processor or blender. I have a ninja pulse blender that I love. 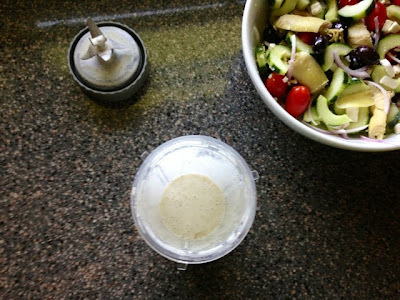 It has single size serving cups that you can blend right in - perfect for making salad dressings. Pour the dressing over the salad, making sure to fully coat everything. You may not need the entire amount. 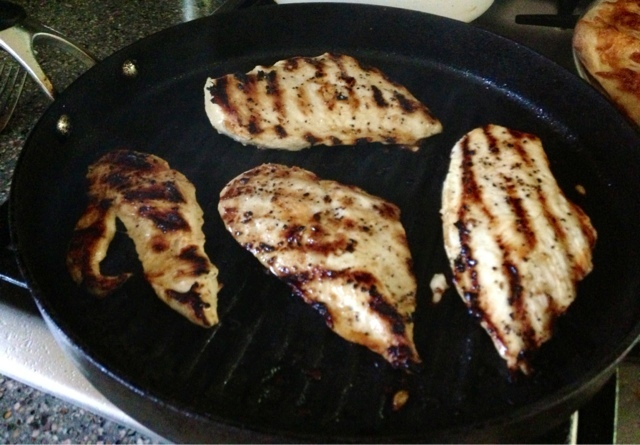 Once your chicken is cooked, place on a cutting board to cool slightly. Slice the chicken into thin strips, and then add to the salad. The dressing really pumps up the flavor value in this dish. Doesn't that look great? My husband and I loved it. 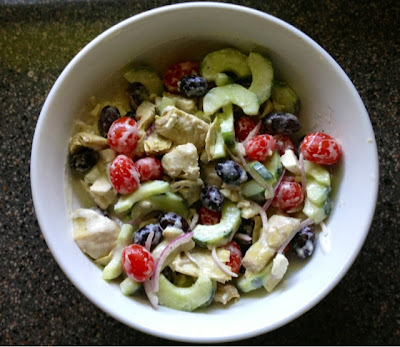 This salad was a great summer dinner, but really you can make it anytime of year with all these ingredients available year round.